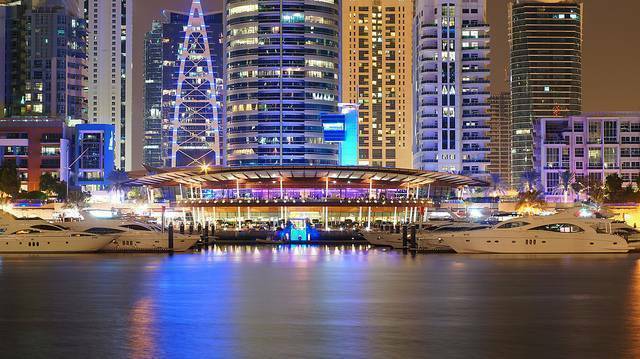 The Dubai Marina Yacht Club defines elegance and splendor. Set among the picturesque backdrop of the Dubai Marina, the Club offers high standard services in dining and entertainment. Its famous Aquara restaurant lies nestled on a terrace overlooking the glittering skyline of the city and the Arabian Gulf beyond, a breathtaking sight to drink in while enjoying a first class meal. On the other hand, the 25⁰55⁰ Café serves an array of international and local favorites to suit everyone’s taste buds. Nightlife at the club is incredible. The Aquara Lounge and YOTS Sports Lounge have attractive offers and discounts, along with cool events, DJs and sports screenings that keep the party going! Athena, the club’s private luxury yacht can set aboard a limited number of passengers for a spectacular cruise along the gulf. One can privately rent out the yacht for a family gathering or romantic dine-out, or join in a sightseeing cruise to spot Dubai’s most famous landmarks. The nautical experience the Athena provides is a prestigious one, and one must make bookings in advance to avoid disappointment. All said, the Marina Yacht Club provides an exclusive, luxurious experience on both, land and sea!